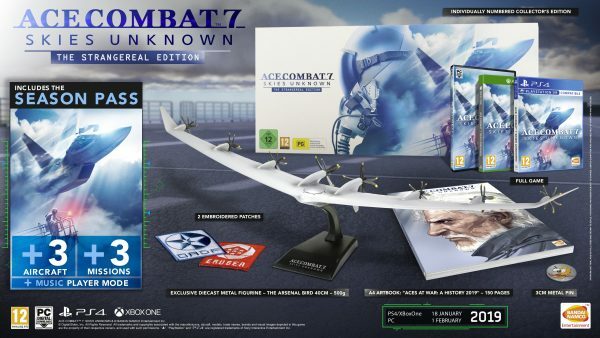 Bandai Namco announced today that Ace Combat 7: Skies Unknown will be receiving a Collector’s Edition in Europe. – Season Pass; including three aircraft, three additional missions and a music player mode. – Two embroidered patches of Erusea and Usea crests. European gamers can pre-order the Collector’s Edition now at the Bandai Namco Online Store. Unfortunately, there’s currently no word yet for the North American territories but it’s very likely that they will receive the same thing. before in a flight combat game. Epic dogfights await! As we are months away before its release, Ace Combat fans can still pre-order to receive bonus items like; playable F-4E Phantom II aircraft, 3 popular aircraft skins from past titles (Su-37, Yellow 13, F-14D: Razgriz, F-15C: Pixy). Ace Combat 7: Skies Unknown will be released for PlayStation 4, and Xbox One via on January 18, 2019. The PC version via Steam will be released on February 1. Check back with us near the release date for our coverage and review of the game. Stay tuned.